2016 brought us a new stud, meet Tristan! 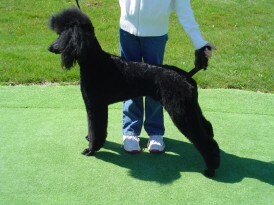 Tristan comes to us from California and has Italian bred dogs in his bloodline including a world champion grampa! Tristan is 55 lbs and is currently working to finish his UKC Champion title, he also LOVES to lure course! Shayne is our resident stud dog, he is the son of Luna and Beau and he is a UKC Champion with many best of breed and Group One wins as well as a Reserve Best in show to date with limited showing. Shayne is a big boy and my husbands pride and joy! Shayne is a Lure Course fanatic with some pretty fast times in fun runs and will be competing soon. He is a bit of a clown at times and when he sees the camping gear getting loaded up he is ready to go! Shayne Lure Coursing, the object is to chase the bunny which is really a plastic bag here but we won't tell him! I saw Luna's picture online and instantly fell in love with her, I never thought I would talk my husband into adding her into our family but to my surprise he felt the connection with her right away too. She joined our family in 2012 and walked right in like she had been here all along! Breeders from all over the world inquired on purchasing Luna from her then owner but after speaking with Kendall she felt Luna would be happiest in our home as a much loved family member, which she definitely is. Luna has traveled all over the US including Hawaii on the AKC show circuit, now she enjoys life here on the farm, playing as much ball as she can and on the summer weekends she enjoys Lure Coursing as seen here at age 7 running the course. Luna is now retired from breeding but we kept her son Shayne and daughter Trinity to carry on her beauty and impeccable personality. OKF Elegance Etched in Silver "Shannon"
O'Kaylyn Farms A Treasure Sent From Heaven pretty much says it all, Treasure is Sierra and Trevor's daughter, Trevor's very last litter before I lost my special boy, she was my keeper but in reality she chose me, she is one special little girl and holds a special place in my heart. She is definately momma's baby! 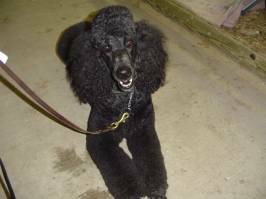 Katalace Sheez The Keeper aka "Lacey"
Kayla's very own Standard Poodle "Lacey" was born to Chauntae & Trevor Feb. 14, 2005. Right before her debut as a mother Lacey suffered a brain injury from being kicked in the head by a horse, she did recover with a lot of TLC and although quite beautiful we have chosen not to use Lacey as a breeding dog and she remains Kayla's constant companion, protector, bed warmer, agility and obedience dog and best friend. I believe they call that a BFF! "Tyler" (Katalace He's the Rebel) was our brown stud for a period of time. Tyler was retired from breeding, neutered and placed in a wonderful loving pet home in May 2010. I rarely place my adult dogs as they are part of our family but the perfect home for him became available and I felt it was the most loving thing I could do for him--let him be spoiled rotten on a daily basis! Tyler in his new home-look at that smile! "Chase" (Katalace I'm Chasing the Dream) is our cream boy. He comes from the same bloodlines as Trevor, Chase puppies have been the ultimate companion dogs and although he is still in great health his age requires him to step down from the breeding scene so that he can devote all his time to stealing everyone's stuffies! Chauntae was our smallest female, she stood only 22" and weighed about 45 lbs. 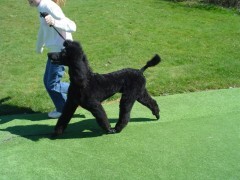 Chauntae was super mellow and very intelligent, she excelled in obedience. Chauntae was retired from breeding in summer 2007. We lost our precious girl at the age of 15 1/2 yrs. 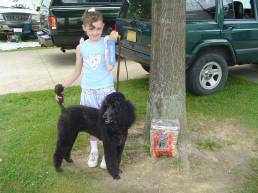 Trevor stood 26" at the shoulder and had a personality that was unsurpassed, everybody loved him, he was very quiet, my constant companion and did very well at obedience, seen here being handled by Kayla. 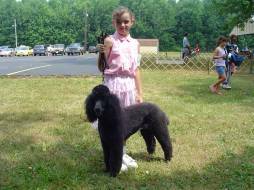 June 12, 2005 Kayla & Chauntae take first place at their very first 4H obedience trial. 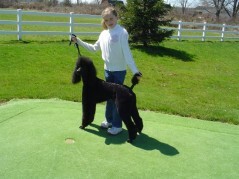 And another first place finish in obedience and also grooming and handling! (July 10, 2005) And yet another first place win in August at the big show! What a great way to wrap up the season! ! 2006 earned Kayla and Chauntae yet another trophy and several 1st place wins, congratulations girls on a job well done! Kayla and Chauntae also took home a trophy at the end of the season for Combined Champion, meaning they had top scores for both handling and obedience! 2007 season earned this pair the handling award for the year! Hey mom down here! What do I need to do for those treats? Our team won the hula hoop relay race! Destiny's color is starting to change from black to blue, she is a very loving, cuddly dog who loves to lay her head on your lap and look up at you with only the whites of her eyes showing! Raina is a real sweetheart! Did you know that if you put a cream dog on green grass it looks white but when you put it in the snow it is definitely cream!